The latest weekly United States Mint numismatic product sales report contains the debut figures for several new products. This includes the Kisatchie National Forest Quarter numismatic bags and rolls, the related three coin set, and the 2015 America the Beautiful Quarters Uncirculated Coin Set. 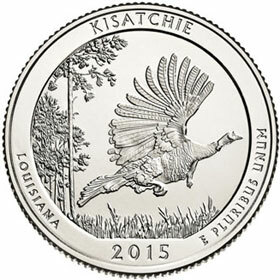 The US Mint began accepting orders for the Kisatchie Quarter bags and rolls on April 20, 2015. Circulating quality coins from the Philadelphia, Denver, and San Francisco Mint facilities were offered across six different product options. The Philadelphia and Denver Mint coins are also issued for general circulation, while the San Francisco Mint coins are only available within numismatic products. Across all bag and roll product options, the opening sales figures accounted for 727,960 quarters from the Philadelphia Mint, 738,760 quarters from the Denver Mint, and 589,120 quarters from the San Francisco Mint. On April 23, the US Mint opened sales for the Kisatchie National Forest Quarter Three Coin Set, containing uncirculated quality coins from Philadelphia and Denver along with a proof quality coin from San Francisco. This product opened with unusually low sales of just 966 units. The final new product release during the period was the 2015 America the Beautiful Quarters Uncirculated Coin Set, which went on sale April 22. The product includes uncirculated examples of each of the year’s quarters from both the Philadelphia and Denver facilities. Sales for the product opened at 12,593 units. I encourage everyone to not buy any more 1st spouse coins until they end the sale of 2013s. It looks like Shenandoah is the new lowest-mintage “S”-mint ATB quarter. @bilbo Any word on when the First Spouse 2013 sale will end? Will these products be there indefinitely until there are no more left, or is there an eventual time limit? Spouse sales are down to a trickle. Don’t think you even need to ask anyone not to buy. Interest has burned out on its own.